Following the success of CFE 223, Hodgdon Powder Company has released a new addition to the CFE (“Copper Fouling Eraser”) line of propellants. 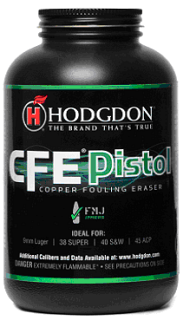 Hodgdon’s new CFE™ Pistol, a general purpose handgun powder, is designed to deliver less copper fouling. CFE Pistol is a spherical (ball) powder that meters very well. Hodgdon hopes to have CFE Pistol available in January 2014. 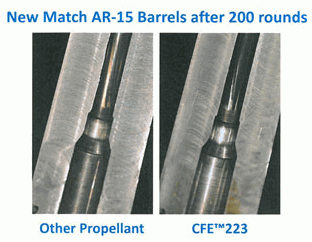 When CFE 223 rifle powder was first introduced, people were skeptical about claims that CFE reduced copper fouling in barrels. In fact, field reports from our Forum members indicate that CFE 223 does deliver on the promise of reduced copper fouling. Our readers also found CFE 223 to be very accurate in a variety of cartridge types. Hopefully CFE PISTOL will perform as well in handguns. Load data for CFE Pistol should be available on Hodgdon’s Reloading Data Center starting in December 2013. Hodgdon plans to provide over 100 available loads for 15 pistol cartridges, and 37 bullet weights. Load data will be offered for 9mm Luger, 38 Super, 40 S&W, .45 ACP and many other cartridge types. To find out more, visit Hodgdon.com, see Hodgdon’s upcoming 2014 Annual Manual, or call Hodgdon at 913-362-9455. Share the post "NEW CFE Pistol Reduced-Fouling Pistol Powder from Hodgdon"